Wind Power: The South Has Been Slow To Harness Its Wind, But That's Changing There are several reasons the region is lagging in wind energy — including lower wind speeds. But now North Carolina is home to the first large-scale commercial wind farm in the Southeast. 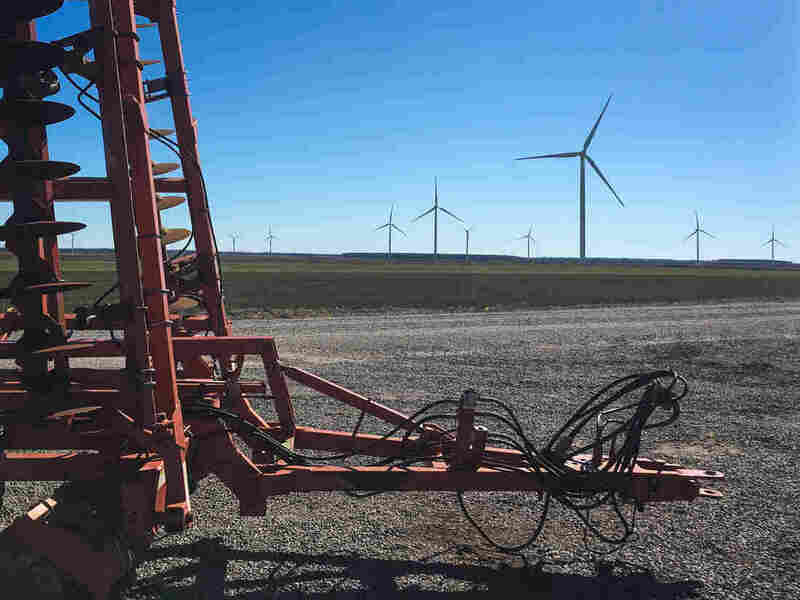 A wind farm near Elizabeth City, N.C., is built on agricultural land that is also used to cultivate crops like corn, soybeans, cotton and potatoes, along with small areas of timberland. Landowners enter into lease agreements with the wind power developer, and receive about $6,000 per year per wind turbine. Wind power is the largest source of renewable energy in the United States. But a broad swath of the country has had no large, commercial wind farms — until now. A new one with 104 towers is up and running near Elizabeth City, N.C., where it spans 22,000 acres. 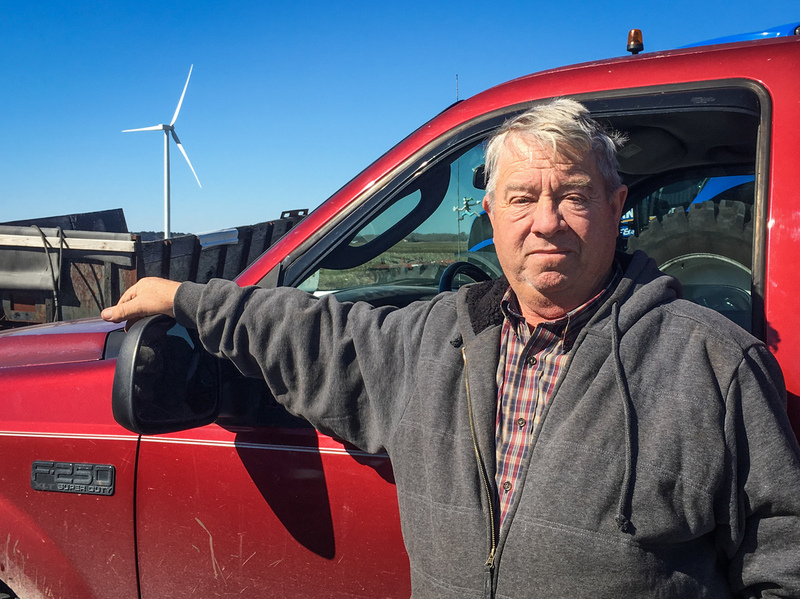 Horace Pritchard is one of about 60 landowners who are leasing property to the project known as the Amazon Wind Farm U.S. East. Developers say it will generate enough power for 61,000 homes per year — power that the Internet retailer Amazon has agreed to buy from the electric grid. Pritchard's farm is about 30 miles from the Atlantic coast — close enough to be windier than areas farther inland. The project is a good deal for Pritchard, who gets an annual payment for each turbine on his land. "When corn's down, that you're not making any ends meet, this will help us pull through a bad year or a hurricane or a drought," he says. The wind farm is considered the first of its kind in the Southeastern United States. But why has the region been so slow to harness its wind? In the Southeast, the strongest winds tend to be higher up than in places like the Great Plains, with their wide open spaces. "There are decent and actually quite good wind speeds at very high elevations above the earth's surface in the Southeast," says Michael Goggin, senior director of research at the American Wind Energy Association. "Thus far, we just haven't had turbines that were large enough to get up there to capture those winds." That's partly a quirk of geography, he says, and partly because the Southeast has a lot of trees and forests. "That interferes with the flow of wind, you know, just basically friction — the wind is slowing down as it hits those trees," Goggin says. Craig Poff is business development director with Avangrid Renewables, which developed the Amazon Wind Farm project. "It took a while for turbine technology to catch up to make this project competitive with what energy would otherwise cost," he says. All of that explains why, aside from a small amount of wind power in Tennessee, the region has lagged far behind the rest of the country in wind energy. That might sound counterintuitive if you're thinking of the robust winds that blow along the ocean. And you'd be right, but coastal wind development can be logistically complicated because of homes, businesses and other structures, and often faces public resistance. "On the beach, there is a lot of wind — that's why people go to the beach in the summer to get cool and be near the water," says Craig Poff, director of business development at Avangrid Renewables, which runs the project. "But you have to balance the placement of wind turbines with the geography." The wind turbines on Pritchard's farm dot the landscape, along with his tractors and other farm equipment. They're tall: The tip of the highest blade stretches close to 500 feet in the air above the base, longer than a football field. The blades make a faint whooshing sound as they slice through the air. Poff says it's hard to tell with the naked eye, but these towers are a little different from the ones you might see in other parts of the country. "They've gotten a little bit taller and the blades have gotten a little bit longer," he says. 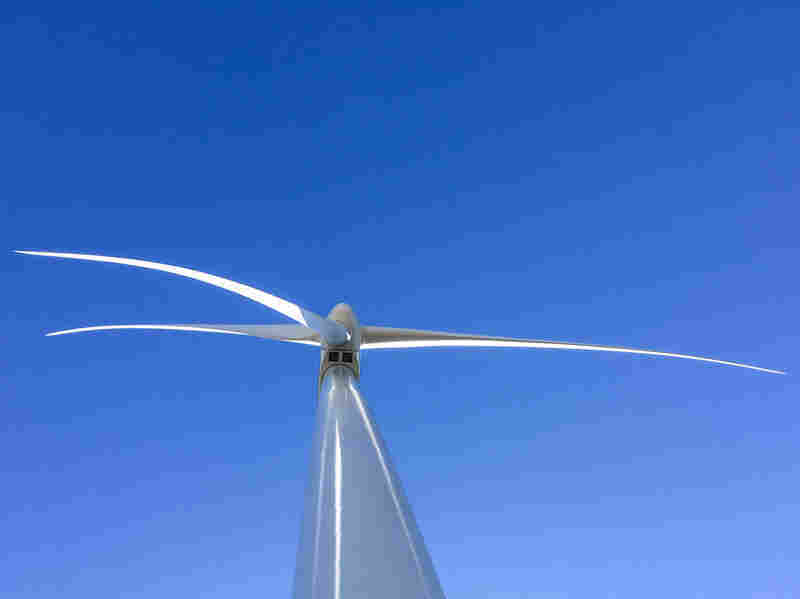 The tip of the highest turbine blade at the wind farm stretches close to 500 feet in the air above the base. About 10 years ago, he says, the tower itself would have been about 250 feet tall. Now the tower alone is about 330 feet. That extra length is possible because of technological advances that make taller towers feasible and more affordable than they would have been a decade ago. "I think it has changed the energy map of the country," says Goggin, of the American Wind Energy Association. "Traditionally, people didn't think there was wind in the Southeast, and now there are projects being built there." Historically, the Southeast has relied on easy access to coal, and in some areas, nuclear power. As the industry has matured and technology has advanced, Poff says the cost of generating wind power has dropped about 65 percent over about the past five years. "Wind energy has to compete with what the cost of energy is in the area," he says. "So here, it took a while for turbine technology to catch up to make this project competitive with what energy would otherwise cost. And here we're competing against old infrastructure." Between cheaper wind, and a recent volatility in coal prices and competition from natural gas, Goggin says renewable fuel is becoming more attractive in the region. Several utilities, from Georgia to Tennessee, have a history of buying renewable energy — from outside the region. "It makes sense that utilities are looking to diversify their fuel mix and lock in a low price with wind energy," Goggin says. Another challenge for wind development in the Southeast and elsewhere is the fact that the nation's electrical grid wasn't designed with renewable energy in mind. Goggin describes the grid as a system of regional fiefdoms with a "little dirt road between them" that aren't set up to efficiently exchange energy. Wind turbines and farm equipment now dot Horace Pritchard's land, where he raises corn, soybeans, and other crops. 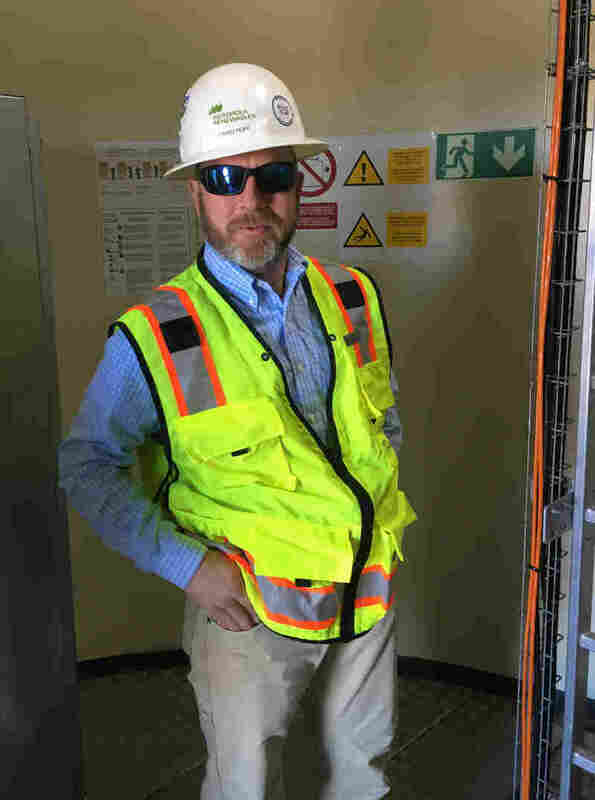 He also receives payments for hosting nine of the more than 100 wind turbines now operating near Elizabeth City, N.C.
"This is just kind of a historical artifact of how we built the power grid in this country," Goggin says. "We didn't really have a national power system or a national electricity market, until the last decade or so." In some areas, utilities wanting to buy and sell wind energy are running against limitations of the existing transmission lines. "So I think that's part of also what's driving interest in wind projects in the Southeast, is that we've hit limits on how much you can bring in from other regions," Goggin says. Wind farms in new areas often run up against pushback from the public. For the project in North Carolina, there were several obstacles. Republican state lawmakers raised concerns that it might interfere with military radar. The Navy reviewed the project and said interference is unlikely. Lawmakers then made a last-ditch request to President Trump to block the project. That has apparently failed, but Trump has expressed skepticism about wind power; he famously objected to a wind farm he said would disrupt the view near one of his golf courses in Scotland. 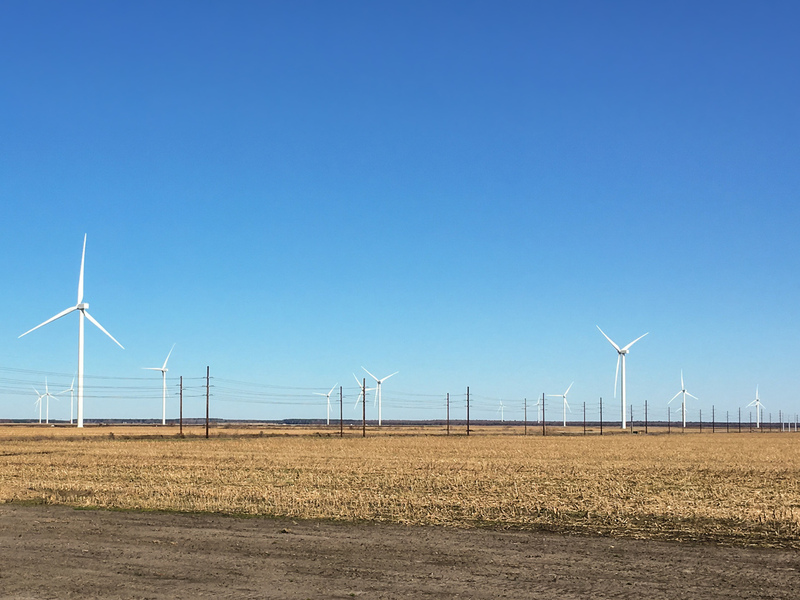 Those concerns, along with worries about noise, land use, and the impact on birds and other wildlife, often pop up around new wind developments. Officials with Avangrid say they hope the North Carolina project will pave the way for more wind power in the region. Spokesman Art Sasse says he believes growing demand from technology companies like Amazon, Apple, Google and Facebook will drive growth in the renewable sector, regardless of politics. "All of those companies now that are going out and purchasing large-scale, commercial, renewable projects — that's not going to stop," Sasse says. "That is where our industry is headed, so it really is about the marketplace." For Horace Pritchard, the economics are working out well; he says the $54,000 he's getting each year for the nine towers on his farm more than offsets the land taken out of production beneath them. Some of the neighbors who initially scoffed at the wind farm are now asking if they can get in on the deal, he says. With a laugh, Pritchard adds, "Over the long-term, nothing I could grow legal[ly] would produce what these are doin'." Horace Pritchard, 68, has lived in this area his entire life. He's the third generation to farm here, and he's planning to pass the land on to his children one day.